Whatever your personal interests are, from athletics to the arts, curricular to community, there’s a good chance Saint Louis has it to offer. With more than 30 student organizations, the University has lined up many activities that will ensure a worthwhile student experience. The University of Saint Louis Tuguegarao celebrates her foundation on February, and for several days around this time, Saint Louis comes alive with a festival-esqu atmosphere. Visitors are treated to a series games, dances, songs, cultural competitions and presentations, and many other events. An entire day is dedicated to nurturing the camaraderie and competitive spirit within departments. For one day every year, students under one department celebrate their day with games, songs, and dance competitions. 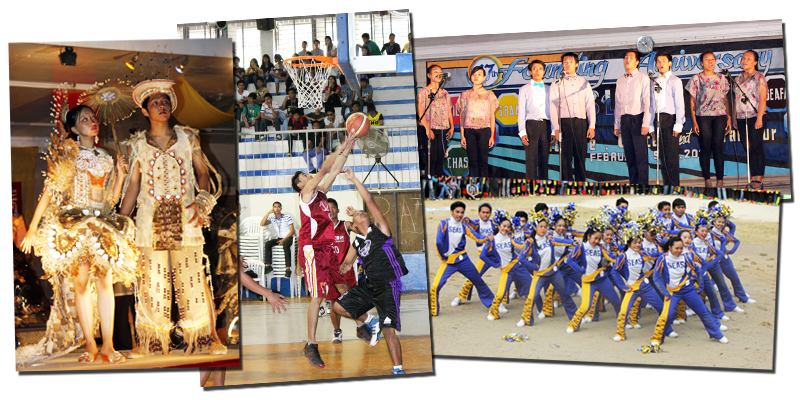 Typically, students in one year level compete against students in another year level in different fields of competition, culminating with a night activity. Educational trips are organized to augment students’ learning by providing a hands-on experience from the outside world. Field trips enhance our curriculum while serving to develop independence and nurture teamwork of our students. Moreover, the challenges that they face outside help develop students’ personal and social skills while making them more aware of the world outside the walls of Saint Louis. Before that start of every academic year, the University, with the help of the Guidance Center, organizes an orientation program for our freshman students and transferees. This help prepare them for the challenging but fulfilling college life. Here the students meet for the first time the people they will be interacting with during their stay in the University: their classmates, teachers, school administrators, and many others. A campus tour is also conducted during this time.